-- Select a Size -- Small - Out of Stock! Medium Large - Out of Stock! X-Large - Out of Stock! 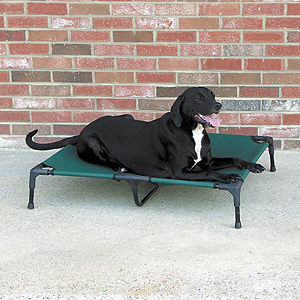 Elevate your pet's lounging experience with our Guardian Gear Pet Cot for Dogs. Our Elevated Pet Cots protect pets from uncomfortable cold, hot, damp, and uneven surfaces. Lightweight cots allow air to circulate beneath dog for a healthier, more comfortable rest. Provides comfortable support for arthritic or geriatric dogs. Spring locks on each durable cot allow assembly and disassembly in seconds without tools, making it the perfect go-anywhere bed for travel and camping. The fabric is heavy-duty polyester oxford, water resistant, and is UV-resistant deep green polyester. The cover is removable for cleaning. The frame is constructed of powder-coated, rust-resistant steel. Velcro® along sides allows the bed to be stretched or relaxed for customized tension. Large size has a center leg and X-Large size has two center legs for added support. *Watch the video below for tips on putting together the cot. Guardian Gear Pet Cot Customer Photos - Send us your photo! Mom- I'm just soooo tired I think I'll take a short nap in my favorite place... Ahhh!! Mr. Barley relaxing on his new patio furniture! Posted On 06/18/16 by Kathi from , WA Yes, Kathi recommends this product! Nice looking and lightweight, but the initial build is trickier than the instructions make you think. The canvas has to be STRETCHED pretty hard to get the last of the frame pieces in place and even my burly husband had a little trouble. I think it will stretch a little more over time and be easier to reassemble later. It will also probably need to be adjusted once it's stretched out a bit, but that should be easy with the velcro that's stitched on to the lower flap. One more thing to consider: it comes out of the package STINKING. So... leave it outside to air out for a day or two if you intend to use it inside. In general, it seems well-built and it's super lightweight, but our dogs are still looking at it like "what's this thing...?" I hope they'll like it better once the smell goes away. Posted On 08/10/15 by Teresa B from Mastic beach, NY Yes, Teresa B recommends this product! Received the cot and couldn't wait to put it together. Millie couldn't wait any longer as soon as it was put together she jumped up on it and began to get comfortable. Ten minutes later she was snoring! Love it! Posted On 11/07/13 by Kathleen T from Stoutsville, OH Yes, Kathleen T recommends this product! I ended up hurting my hand putting it together, however the inatructions are easy. My chihuahua loves it in the summer it keeps him cool and in the winter I put a blanket on it for him. Baxter Boo seems to be low on some items I am interested in at times. Otherwise, there is a good selection of items. I am usually looking for treats and toys, as well as bully sticks. I have also shopped for skin treatment for dogs and boots and coats.